VCT fundraising in 2018/19: How much was raised? Who raised the most? Venture Capital Trusts raised £731 million in the 2018-19 tax year, overtaking the year before – despite a very different shape to the year’s fundraising. 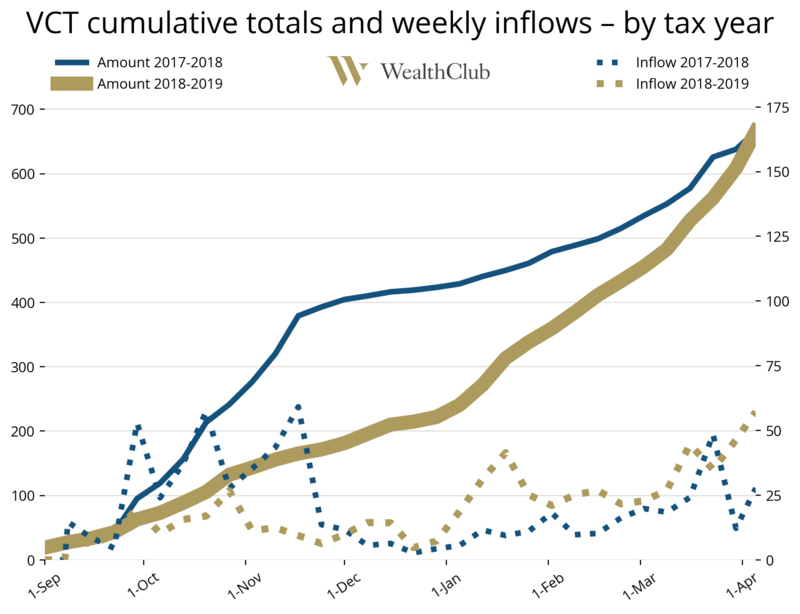 Wealth Club has tracked new VCT share offers throughout the tax year; our figures showed the amount raised by these offers was almost exactly the same as the year before, at £665 million. When dividend reinvestment and other sources of funds are added, figures from the AIC show £731 million in total was raised in total – £3 million higher than in 2017-18. 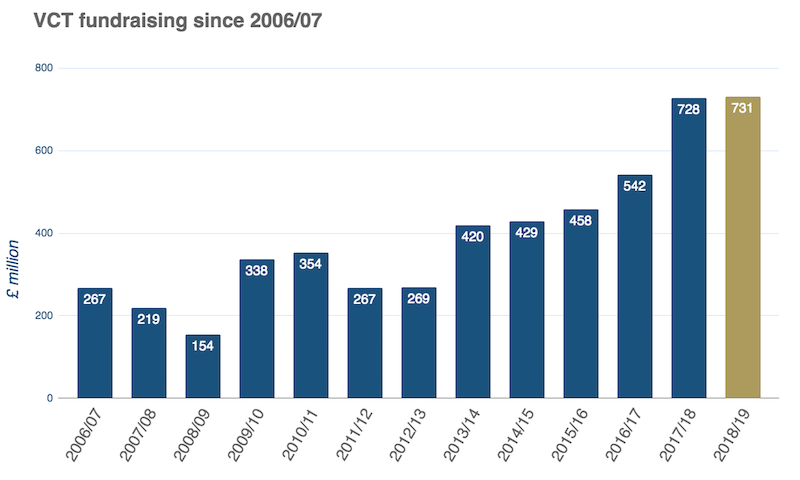 It is the second highest annual inflow on record, behind only 2005/06 when initial tax relief on VCTs was at the higher rate of 40 per cent. There was no ‘Budget bump’ this year as experienced during 2017-18, when VCT offers opened early in the tax year and filled rapidly, prompted by fears the Chancellor would change the tax benefits of VCTs in his mid-November 2017 budget. This year, despite the slower start, the amount raised into new share offers has ended up almost identical. Wealthier investors shrugged off Brexit uncertainty and continued to invest in venture capital trusts. Source: Wealth Club, based on figures obtained directly from the VCT managers. How much did each VCT offer raise? Overall, 20 VCT share offers opened during the year, raising funds for 33 Venture Capital Trusts in total. Twelve of these offers were fully subscribed before tax year end. Source: Figures obtained by Wealth Club direct from the VCT managers. They include amounts raised by new share offers opened during 2018/19. They don’t include dividend reinvestment or continuations of the last tax year’s offers. Offers are listed alphabetically. ** Octopus Titan VCT increased the size of its offer in March, after meeting its initial target and using its £80m overallotment facility. Octopus Titan VCT set out to raise up to £200 million, a repeat of last year’s record fundraise. It ended up capturing even more of the market, taking the unusual step of extending the size of its offer in mid-March in response to demand. Titan ended the year on £228 million – around one-third of the entire market – at a rate of £1.1m a day. 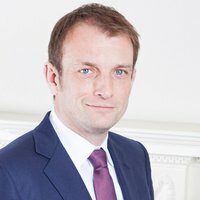 ProVen VCTs, buoyed by a year of eye-catching exits, raised the second largest amount, with around £64 million flowing into the two Beringea-managed VCTs in 84 days. The third highest amount was raised by Foresight 4 VCT, which met its £50 million fundraising target as the tax year drew to a close. Several longstanding generalist VCTs attracted a large chunk of the year’s funds, having adapted their investment strategies since the 2015 rule changes. The two British Smaller Companies VCTs launched their first significant fundraise since 2015, raising £35 million in 75 days from December to February. NVM’s three Northern VCTs raised £20 million in 11 days in January 2019 – nearly the fastest fundraise at £1.8m/day, only pipped by Baronsmead VCTs which filled a £25m fundraise in 13 days, partly driven by the prospect of a dividend in March 2019. 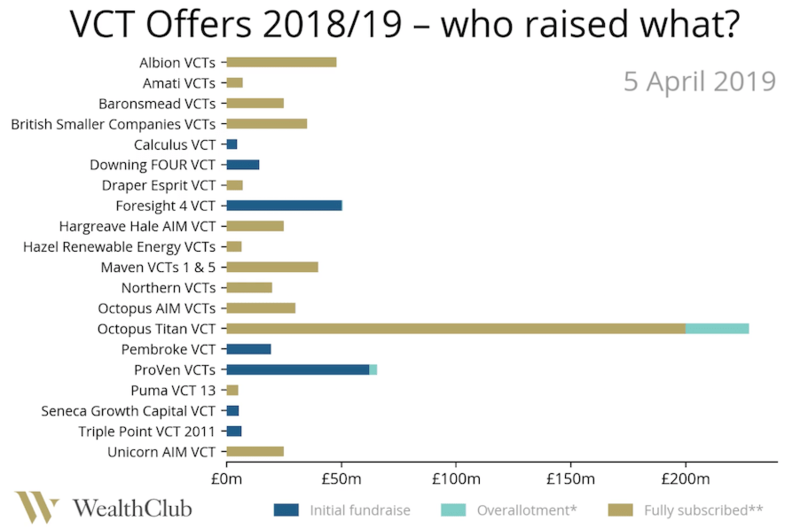 Albion VCTs raised their largest total to date (£48m), with all six of their VCTs raising £8 million, and Maven raised £40 million into two of its five VCTs. Although the majority of VCT fundraising happened between January and April, it’s not the only time of year investors subscribe to VCTs. The Octopus AIM VCTs raised £30m in 59 days from August to October, and Hazel Renewable Energy VCTs – since renamed Gresham House Renewable Energy VCTs – raised a rapid £6.5 million in 8 days in September 2018. The year also saw a variety of new offerings for VCT investors. Seneca Partners was a newcomer to the VCT scene, raising £5.3 million into a new share class of the Hygea vct, now renamed Seneca Growth Capital VCT. Triple Point also launched a new evergreen ‘Venture Share’ class of its 2011 VCT, raising £6.6 million. Meanwhile a new partnership with Draper Esprit helped the former Elderstreet VCT raise £7 million and rename itself in the process. Ordered by the date they opened. Gold text indicates closed offers. Amounts and days open are to 5 April 2019. Source: Figures obtained by Wealth Club directly from VCT managers. Amounts are for new share offers opened during 2018/19. They don’t include dividend reinvestment or continuations of the previous tax year’s offers. * The Downing FOUR VCT offer included both a Generalist and a Healthcare share class. Most of the offers available last tax year have closed, but some VCTs remain open. If you are an experienced investor comfortable with the risks and believe VCTs may be for you, there are two good reasons to consider investing at the start of the tax year rather than waiting until 2020. First, you could receive an extra year’s worth of dividends (variable and not guaranteed). Second, the tax relief could be paid to you during the year rather than reclaimed back afterwards via your tax return. Tax rules can change and tax benefits depend on circumstances. Remember, the speed, size and success of a VCT’s fundraise does not necessarily indicate how well the investment will perform; you should form your own considered view and if unsure, seek advice.